Coming of Age films are among my favorite types of movies, but if you're a fan of the genre, you know there are often a lot of strange stories out there, perhaps none stranger than White Rabbit. This film follows Harlon Mckay (Nick Krause), who is a very strange kid, one that is often bullied. Harlon is very easily influenced by other people, as is evident by the scenes with his co-stars. When he's with his best friend, whose immature, they do kid things, and when he meets a bad girl, who doesn't stay in on place very long, Harlon gets into some trouble himself. There's no doubt that Harlon is strange, but so are the circumstances surrounding him. Newcomer Nick Krause plays the troubled lead and he really was terrific. In ninety minutes, this kid must of changed personalities a dozen times, and all of them were tremendous. 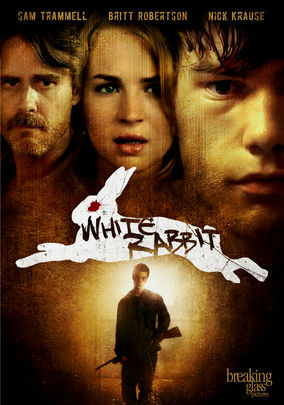 White Rabbit is very weird, a little creepy, and nothing special until a shocking ending changes everything. Sometimes how you see a film can be changed by an ending that just blows the mind and answers a million questions at once. That is what happens here, and that is the only reason I recommend watching this film. As I've been saying, it's really strange and some parts are hard to sit through, but in the end, you'll be left thinking about what you just saw and wondering about each and every scene. Honestly, it's the kind of film you really need to see more than once if you're hoping to catch everything.